I WOULD SAY THAT THE MOST FREQUENT QUESTION I GET AT THE SALON FROM GUESTS IS: “WHAT IS YOUR FAVORITE SHAMPOO AND CONDITIONER?” UNTIL RECENTLY I WOULD SAY THAT MY ANSWER WAS ALWAYS THAT IT DEPENDS ON YOUR HAIR NEEDS. NOW, I DO ABSOLUTELY STILL STAND BY THIS STATEMENT. EVERY HAIR TYPE AND TEXTURE HAS SPECIFIC NEEDS THAT CAN BE MET BY A SPECIFIC TYPE OF SHAMPOO AND CONDITIONER. WE USE LABEL.M PRODUCTS AT NOVACHIS SALON, AND I WOULD SAY THAT OUT ALL OF ALL OTHER PRODUCT LINES I HAVE WORKED WITH, THEY DO A GREAT JOB OF ADDRESSING INDIVIDUAL NEEDS AND HAVE A GREAT SELECTION OF SHAMPOO AND CONDITIONER. ABOUT A YEAR AGO, I TRIED THE LABEL.M DIAMOND DUST SHAMPOO AND CONDITIONER FOR THE FIRST TIME. TO SIT HERE SAYING THAT I WAS SKEPTICAL WOULD BE AN UNDERSTATEMENT. I KNOW THAT EVERYTHING I HAVE USED FROM THIS PRODUCT LINE HAS BEEN GREAT AND THE PRODUCTS TRULY DO AS THEY SAY THEY WILL. HOWEVER, I AM NOT ONE FOR GIMMICKY THINGS AND IF YOU TELL ME THERE ARE DIAMONDS IN MY SHAMPOO I WILL NOT AUTOMATICALLY THINK IT IS GOING TO WORK. BUT IF IT DOES WORK, I DO FEEL THE NEED TO TELL THE WORLD, OR WHOEVER WILL LISTEN, ABOUT IT. I HAVE BEEN IN THE SALON INDUSTRY FOR OVER 12 YEARS AND HAVE WORKED WITH THE MOST PRESTIGIOUS PRODUCT LINES AVAILABLE ON THE MARKET. 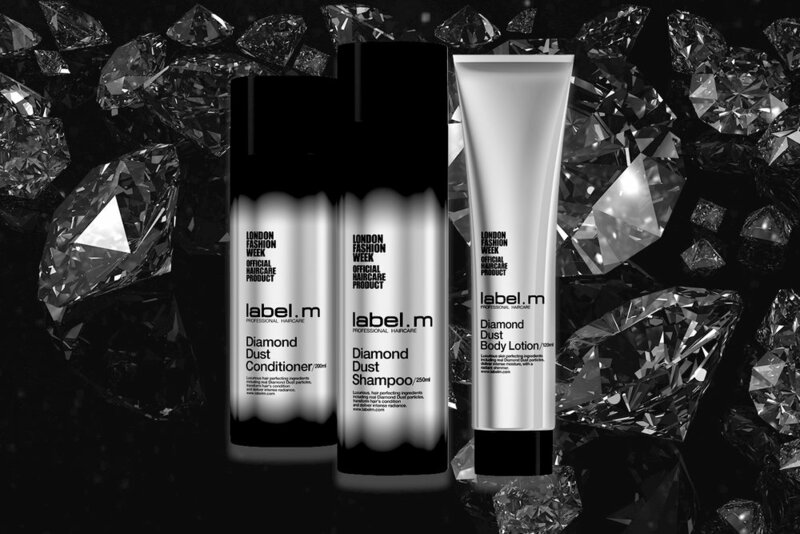 THE DIAMOND DUST LINE FROM LABEL.M WAS UNLIKE ANY SHAMPOO AND CONDITIONER I HAVE EVER USED BEFORE. THE SHAMPOO LATHERS SO WELL, YOU TRULY FEEL LIKE YOU ARE CLEANSING, AND THE PRODUCT IS FREE OF SULPHATES AND SODIUM CHLORIDE. A SMALL NICKEL SIZED AMOUNT OF CONDITIONER LEAVES THE HAIR FEELING SILKY SOFT, EASY TO MANAGE AND FREE OF UNNECESSARY WEIGHT. THIS IS WHERE SCIENCE IS AN IMPORTANT PART OF THE SUCCESS OF THIS PRODUCT. THE DIAMOND DUST SHAMPOO USES AN EXCLUSIVE MICRO-DIAMOND COMPLEX WHICH IS COMPOSED OF BLACK AND WHITE DIAMONDS. THESE PARTICLES ACT AS A GENTLE EXFOLIATOR TO THE HAIR AND SCALP, AND REMOVES EXCESS BUILD-UP OF TOXINS. THE PRODUCT ALSO CONTAINS CHAMPAGNE, WHICH WORKS AS A DEEP CLEANSER TO REVEAL THE HAIRS NATURAL SHINE. THE CONDITIONER CONTAINS RICH PROTEIN THAT STRENGTHENS, PROTECTS AND HYDRATES THE HAIR, LEAVING IT BEAUTIFULLY SMOOTH, SILKY AND WEIGHTLESS, WITH INTENSE RADIANCE AND SHINE. THIS IS THE ABSOLUTE BEST SHAMPOO AND CONDITIONER I HAVE EVER USED AND I TRULY BELIEVE IT IS GREAT FOR ALL HAIR TYPES. MANY OF OURS GUESTS CONTINUE TO SAY THAT THEY CAN NEVER SHAMPOO THEIR HAIR WITH ANYTHING ELSE, AND I FEEL THE SAME WAY!